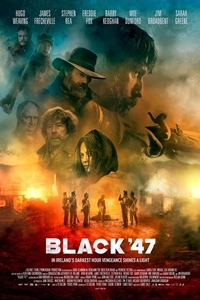 Sorry, but Black 47 is either started or over at Clifden Station House. It’s 1847 and Ireland is in the grip of the Great Famine that has ravaged the country for two long years. Feeney, a hardened Irish Ranger who has been fighting for the British Army abroad, abandons his post to return home and re-unite with his estranged family. He’s seen more than his share of horrors but nothing prepares him for the famine’s hopeless destruction of his homeland. He discovers his mother starved to death and his brother hanged by the brutal hand of the English. With little else to live for, he sets on a destructive path to avenge his family, systematically working his way up the political and social hierarchy of 19th Century Ireland. Hannah, an ageing British soldier and famed tracker of deserters, is sent to stop Feeney before he can further stoke the fires of revolution. But Hannah and Feeney are old army comrades with a mutual respect forged by their times fighting together. Personal bonds and shifting allegiances cause both men to question their motives, as they are tested to the limit by the hellish landscape of the Great Hunger.